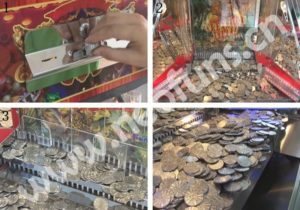 The Coin Pusher game operates in just the same manner that other games in the arcade machine are operated: you insert your coin, press the start button, and hope for your luck and have fun as well. But there’s a difference. If you win a game, you get not just a high score on the monitor or video screen, but you win cash. So if you are playing not just for fun and you are set on winning cash, definitely there is a strategy that you should use. And that strategy involves skill and timing. First, find your pennies. In the hustle and bustle of a busy arcade, people often lose track of the odd penny. Good places to look that often yield is in between machines, under machines and even on top of machines where people may have left them. Also, don’t forget to check inside the coin collectors at the lower front of the machine where you collect the coins, you will almost always find some there. Find a likely looking machine. You can determine this in a number of ways. First, check to see the one with the most coins. That’s the one with the most coins on the top layer and the bottom layer. Slide in as many as you can in at once. It should pay out. Be sure to insert the coin(s) when the pushing arm is furthest away from the slider. So before you play, devise your strategy. Then get your coins ready to go. Your ability to win will impress your friends at the amusement park.